Nowadays, bathroom countertops are available in plenty of color, shapes and material choices. The latest fabrication and cutting technology can provide you the countertop exactly according to your specifications. Granite has always been the most popular choice when it comes to the countertop material. Undoubtedly, granite acquires all the qualities which homeowners look in a countertop material. Granite countertops are mostly tried and tested in the kitchen. Granite offers arrant working surface as a kitchen countertop material. Now what about bathrooms? Is granite apt choice for bathroom countertop material? Is it right to install granite countertop in bathroom? Well, read below mentioned information before opting for granite as your bathroom vanity to material. Just like kitchens, granite is a suitable material for bathrooms countertop as well. Granite is one of the hardest countertop materials available in the market. Every homeowner expects their countertop to provide countless years of services. 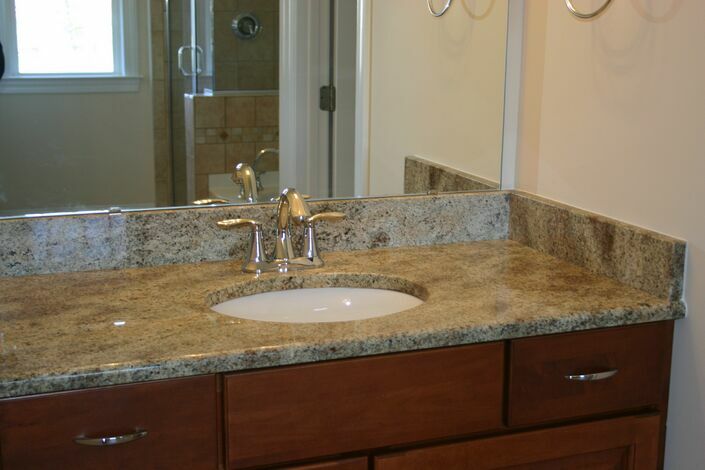 Since granite is hard and durable, it can withstand in your bathroom for a good number of years to come. Granite countertops can survive even after getting wet. This countertop material does not lose its shine due to water. Water does not affect the granite countertop. It means you freely use granite in your bathroom. The scratch and stain resistant quality of granite are another reason for choosing it as a bathroom countertop material. Granite does not develop scratches easily. It means your countertop will remain unaffected by daily wear and tear. Also, you need not have to worry about nail polish stains, lipstick marks and other spills on your granite bathroom countertop. Your countertop will not get stained. One of the most remarkable features of granite countertops is their beauty. Just like in kitchen, granite looks equally beautiful in the bathroom. Granite slabs are extremely heavy, which makes their installation quite difficult. Since it is a heavy material, its transportation and granite countertop installation cost is also more. In total, granite is an expensive material for bathroom counters. Moreover, if you want to use granite countertop in your bathroom, you will have to pay attention over granite sealing.